Have you had a chance to try our new Direct Trade coffee, Costa Rica La Lia Finca Dragon? This exceptional coffee comes from the award winning farm of Finca Dragon. This micro lot is exclusive to Red Cedar Coffee Co.
Finca Dragon is located at 1800 meters in Santa Rosa in León Cortés, about a 2 ½ hour drive from San Jose in the Tarrazú region. 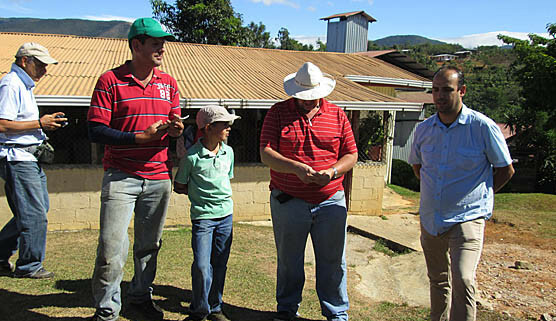 Luis Alberto Monge is the producer and owner of the farm and micromill. The micromill, named La Lia after Luis’ mother, was built in 2007. By owning a micromill the family can separate the coffee varietals and process the coffee using various methods. Most importantly, the micromill allows Luis to ensure that his coffee is being processed carefully and at the highest attention to detail. The coffee varietal is red catuai and our coffee has been processed using the honey (miel) process. After the coffee has been processed the coffee is sun dried. The micromill has raised African beds along with patios for drying. Check out our video to learn more about our Direct Trade relationship with Finca Dragon. March 1, 2016 /by Anne D.